Our Circular Calendar counts the number of days to be calendared for you and is designed to help you not miss a court date or deadline. If you would like us to mail you one of our Circular Calendars, please click the “REQUEST” button below and send us the necessary mailing information. DISCLAIMER: The holiday schedules used in these calculations are primarily the legal holidays for the state. They are obtained from public sources and represent a best effort at obtaining accurate information, but are not guaranteed to be accurate at all times or for all areas. Schedules for specific courts within a state may differ from the rest of the state. 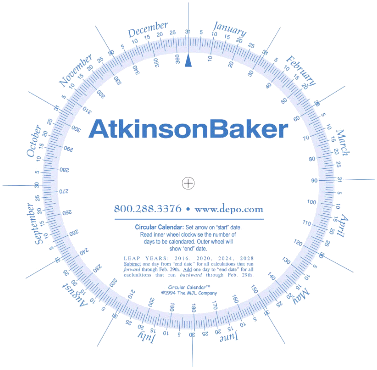 Court schedules may change without notice to Atkinson-Baker, Inc. It is the user’s responsibility to confirm the accuracy of these schedules for any specific court, district, or time period. If you see an error in a schedule, please write to us at webmaster@depo.com. This calculator has been tested in Internet Explorer, Firefox, and Chrome.